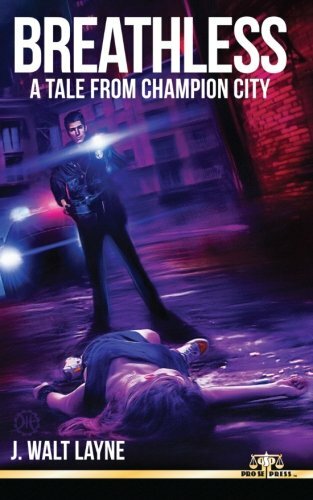 A publisher of New Pulp and Genre Fiction, Pro Se Productions announces the release of the second volume in Author J. Walt Layne’s Champion City crime fiction series. Breathless: A Tale from Champion City is now available in print and will soon be available as an eBook from Pro Se. Welcome back to Champion City. There’s a new medical examiner in town. Working girls and lonely hearts are catching a tough break on the streets of the city. An unknown killer, a quiet man of malevolent intention, is carousing in low places. A young patrolman catches a bullet when he interrupts the killer in the act. A stack of unsolved possibly related homicides point to a cover up. The previous medical examiner and a parish priest are sharing space in the morgue. The new ME appoints Thurman Dicke as a Special Investigator. Can he clear the cases, find the clues and catch the killer before the next anonymous girl dies? Or will he be, like the murderer’s victims, be left Breathless? Breathless: A Tale from Champion City is the latest chapter in Author J. Walt Layne’s series from Pro Se Productions. The tale returns us to the mean streets with Thurman Dicke, first seen in A Week In Hell. Mixing the rawness of 1950s crime fiction with the sophisticated brutality of modern noir, Layne delivers another one two punch on this bloody return to Champion City. Follow Thurman Dicke into the shadowy alleys of depravity in Breathless by J. Walt Layne from Pro Se Productions. Breathless: A Tale from Champion City featuring evocative cover art and logo design by Jeff Hayes and print formatting by Percival Constantine is available at Amazon or at Pro Se’s own store at http://tinyurl.com/q3got8g for only $9.00. The digest novel will be available in coming days as an eBook.